An artistic rendering on how the solar panel array might look. Here comes the sun: Cornell hopes to expand its renewable energy portfolio as it benefits from the NY-Sun Initiative, a series of large-scale, solar energy projects expected to add about 67 megawatts of solar electricity to the state. New York Gov. Andrew Cuomo's office announced July 9 that the New York State Electric Research and Development Agency (NYSERDA) will fund Cornell's project, and, in turn, the university will partner with grant awardee Distributed Sun LLC, a company that builds and operates state-of-the-art solar-power generation systems. This project advances the goals of the new Southern Tier plan to obtain 2 percent of the region's electricity from solar power by 2032. On Cornell's behalf, current plans call for Distributed Sun to install 6,766 solar photovoltaic panels on a 10-acre Cornell property site on Snyder Road, adjacent to the Ithaca Tompkins Regional Airport. 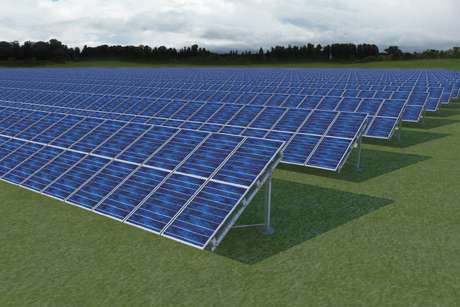 The solar photovoltaic panel array, pending approval from the town of Lansing and finalizing the developer agreement, will be Cornell's first large-scale solar project and is expected to produce about 2.5 million kilowatt-hours annually, or about 1 percent of Cornell's total electricity use. That's enough electricity to power about 320 homes for a year. Sarah Zemanick, sustainability management specialist, led the project team. Says Kyu Whang, Cornell vice president for facilities: "Pending local approvals, this represents a significant step to advance Cornell's renewable energy portfolio. A Lansing solar facility would align with the carbon reduction goals of Cornell, Tompkins County and New York state." Symbolically, this is an important step toward implementing the Cornell Climate Action Plan, targeted to eliminate campus greenhouse gas emissions by 2050 by replacing fossil-fuel carbon energy with clean, renewable energy. Distributed Sun co-chairman Jeff Weiss '79 says: "Distributed Sun and Cornell are working to advance solar generation near the Ithaca campus. Gov. Cuomo encouraged investment and designed programs to attract capital. This Cornell project demonstrates that the state can work well with developers, investors and energy users such as Cornell to reduce carbon emissions and expand renewable output. We're a proud partner with Cornell, and are excited for the opportunity to build on this model and complete many more projects in Ithaca, New York City and wherever the university needs electric power." The solar panel array will not interfere with pilots at the airport, since the panels sport anti-reflective glass to retain as much of the sun's energy as possible. Several solar panel arrays at the Denver, San Francisco and Indianapolis international airports have been built. They present no hazard to airspace safety, according to the FAA. Distributed Sun is including 10 solar panels for Cornell academic use. This will include physical access to manipulate the 10 panels and access to the Web-based dashboard of the array's state-of-the-art monitoring software. It is planned that energy and real-time energy use data will be publicly available on the Web. The Cornell and Distributed Sun solar array aligns with the Southern Tier's regional plan to reduce carbon emission and strengthen the local economy. In the late spring, the Southern Tier Regional Economic Development Council and the Tompkins County Legislature endorsed the 22-point "Cleaner Greener Southern Tier" plan, which establishes goals for reducing carbon emissions by 32 percent over 20 years. The NY-Sun Initiative strives to expand the renewable energy market in New York state while working to steadily bring down the costs of the technology.